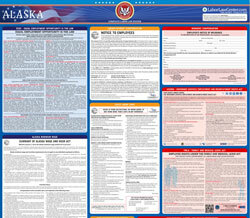 The Summary of Alaska Child Labor Law is a child labor law poster by the Alaska Department Of Labor and Workforce Development. This is an optional poster, so while it is recommended that you post this if it is relevant to your employees, you are not required to by the Department Of Labor and Workforce Development. This poster is optional to post and may be posted in a place where any person under age 18 is employed in Alaska. It specifies rules on the number of hours and work times that can be assigned to minors of different ages, and specifies certain exemptions to various child-labor regulations. It must be printed landscape on 8 1/2" x 14" paper. It appears you don't have a PDF plugin for this browser. Please see the link below to download alaska-child-labor-law-summary.pdf. 1. Newspaper 	sales and delivery. 2. Baby	-sitting, handiwork and domestic employment in or about private homes. 5 a.m. and 9 p.m. and total hours worked will be limited to 23 in any week. Work hours will be limited to 40 hours per week between the hours of 5 a.m. and 9 p.m.
1. Occupations in manufacturing, handling or use of explosives. 2. Occupations of motor vehicle driver or helper (some 	limited restrictions). 3. Mining operations including coal. 4. Logging or occupations in the operations of any sawmill, lathe mill, shingle mill or cooperage. 5. Operation of power	-driven woodworking machines. 6. Occupations with exposure to radioactive su	bstances and to ionizing radiation. 7. Operation of elevators or other power	-driven hoisting apparatus. 8. Operation of power	-driven metal forming, punching and shearing machines. 9. Occupations involving slaughtering, meat packing, processing or rendering	. 10. Occupations involved in the operation and cleaning of power	-driven bakery machines. 11. Occupations involved in the operation of power	-driven paper products machines. 12. Occupations involved in the manufacture of brick, tile and kindred products. 13	. Occupations involved in the operation and cleaning of circular saws, band saws, and guillotine shears. 14. Occupations involved in wrecking, demolition and shipwrecking operations. 15. Occupations involved in roofing operations. 16. Occupations involved 	with excavation operations. including telegraph and telephone lines. 18. Occupations involving exposure to bloodborne pathogens. goods are manufactured, mined or otherwise processed. 2. Occupations involved in operation of power	-driven machi	nery other than office machines. 3. Occupations in construction (including demolition and repair) except office work. 4. Any work in an establishment that serves alcoholic beverages. 6. Occupations in or about canneries, exce	pt office work. 7. Work performed in or about boilers, engine rooms or retorts. 8. Work involved with maintenance or repair of the establishment’s machines or equipment. 9. Occupations that involve working from windowsills, ladders, scaffolds or their subs	titutes. 11. Work in freezers, meat coolers, or preparation of meat for sale. 12. Loading/unloading to or from trucks, railroad cars 	or conveyers. 13. Occupations in warehouses and storage except office and clerical work. 14. Occupations involving use of sharpened tools. 15. Occupations in transportation of persons or property except office or sales work. to a 30	-minute break during the workday. also have an approved work permit. AS 11.76.106 restrict	s access to areas where tobacco and tobacco products are sold. Minors under 19 may not sell tobacco or tobacco products in the course of their employment. 15 AAC 160.480(b) prohibits the sale of pull	-tabs by anyone under the age of 21.
harvesting, processing, packaging, transporting or selling.